Visionscape struggling with huge task of evacuating over 33,000 metric tones of wastes generated daily in Lagos. Members of the Incorporated Trustees of Waste Managers Association of Nigeria (WMAN)otherwise known as Private Sector Participation (PSP) Waste Operators have refuted claims of a purported settlement agreement with the Lagos State Government describing it as pure lies. 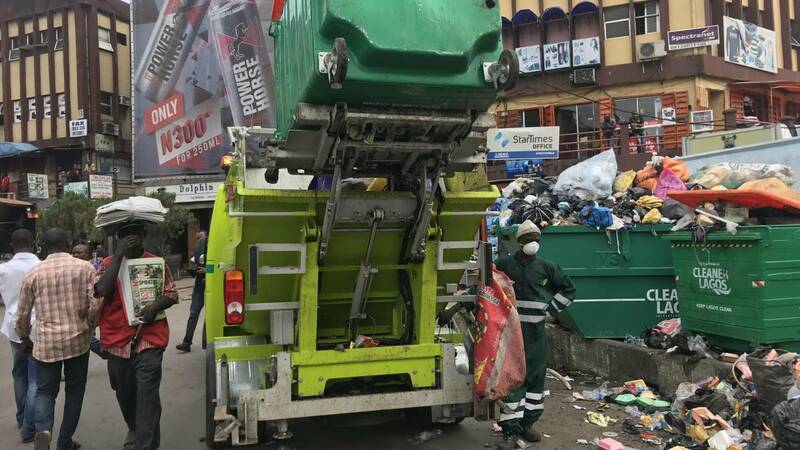 The waste managers insisted that the offer proposed to them by Visionscape, a foreign waste management engaged by Lagos State Government is tantamount to slavery saying they cannot be slave in their own country. In a statement issued signed by the Chairman of the association, Alhaji Ola Egbeyemi, the PSP waste operators said: “There is no such thing as settlement. They are insisting that we keep to commercial waste collection while Visionscape solely carries on with domestic waste collection and disposal. The operators further explained that while Visionscape has signed a 10-year straight MOU with the State Government, it has decided that it will only go into a year engagement agreement with them. “In fact, they had originally said they will sign an agreement of two months with us, it was when we completely resisted that, they agreed to go into an agreement of one year with us, what then happens after one year? “It’s obvious that they only want to use us to stabilize their business and dump us, this cannot be the sort of settlement government wants us to go into with them. The company(Visionscape) will enslave us economically if we accept the conditions it has set before us.”, the waste operators said. to achieve a cleaner Lagos under the negotiated settlement terms and after consultation with all parties. We wish to commend His Excellency, the Executive Governor, Akinwunmi Ambode for his listening ear and uncommon maturity by accommodating our concerns and grievances in this review. The Ministry of Environment have also worked tirelessly towards this peace accord. At this point as we approach the rainy season, we humbly appeal to the remaining stakeholders to embrace peace and remain resolute and Committed to the Cleaner Lagos Initiative. Convener, Concerned stakeholders of AWAM. Who are the fake Concern Stakeholders? It is very sad that this government that came in with the active campaign of PSP will turn around to back stab them. Why would the Emperor jetissioned over 350 or so local enterprenuers for 1 foereign company? Is that the way the developed countries developed. Ambode should come down from his high horse and humbly admit that he has erred as far as waste management in Lagos is concerned. The debt burden of this Visionscam thing will enslave the government for years.